Michael Darragh Macauley believes the time is right for this Ballyboden St Enda’s team to come of age. Macauley and Paul Cahillane of Portlaoise ahead of Sunday's AIB Leinster club senior football final. BALLYBODEN MIGHT BE the new kings of Dublin — but Michael Darragh Macauley believes that Portlaoise’s provincial pedigree makes them favourites for Leinster glory. No club comes close to the dominance that Laois men have enjoyed since 2007 in stringing together a remarkable nine county titles in a row. But they haven’t been able to carry their recent supremacy beyond county lines and won just one of their record seven Leinster crowns in that golden period, in 2009. 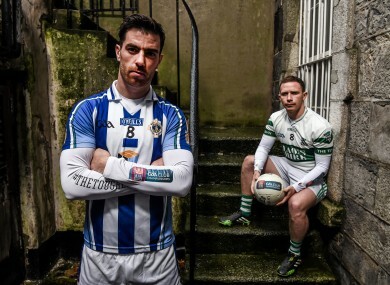 While they set out to right that wrong in Sunday’s final, Ballyboden are dreaming of provincial success for the first time in the club’s history. “This is completely unprecedented territory for us in a Leinster final,” Dublin star Macauley said. “Portlaoise are very experienced when it comes to Leinster. They are the Klitschko, we’re like the Fury coming into this. But if you look at last weekend, sometimes Fury can beat the Klitschkos. Whatever about Sunday — the bookmakers have Ballyboden as slight favourites, in fact — the Rathfarnham side were clear underdogs when they dethroned St Vincent’s in the Dublin final last month. It was only the third county football title for a club where the big ball has been overshadowed by hurling of late. “We’ve been called a hurling club for years,” Macauley said. Even (county chairman Sean Shanley) came out to us and made a speech after we won the Dublin final, and the first thing he said was, ‘I thought this was a hurling club.’ He said he had his speech planned for St Vincent’s that night! “There’s not really a rivalry, to be honest. The hurlers have been fantastic over the last few years and the good thing is that the dual players play with both. “It’s not like with the Dublin team where they play with one of the other, and in that sense, there probably is a bit of a rivalry. While Boden’s win may have surprised Shanley and others, Macauley felt that the time was right for this current group of players to come of age. I’d been hearing for years about these young fellas winning at underage for Ballyboden, winning Feiles and coming up through minors, potential superstars in the making. “They’re finally hitting 19-21 now and breaking into our team and really pushing for places and establishing themselves as senior players who are as good and better than anyone on the team. “I won’t put myself in the ‘aul fellas’ group yet — I reckon I’ve another year to go — but there’s the likes of (Conal) Keaney, (Stephen) Hiney, Declan O’Mahony and Andrew Kerins who’ve been around for a long time and seen it all before. Those happy memories from 2009 were soured by Boden’s Leinster run, when they were unexpectedly beaten by Garrycastle of Westmeath in the provincial semis. Under the guidance of Andy McEntee, they have already gone one step better this year, but they are under no illusions about the challenge that awaits. “Sometimes people expect a Dublin team to walk through Leinster like Kilmacud and Ballymun and St Vincent’s who have all done well for themselves in Leinster and the All-Ireland series. We got a rude awakening (in 2009). It definitely stuck with us. “It’s not easy to win the Dublin championship so it’s important to take every advantage in Leinster when you can. Email “'Portlaoise are Klitschko and we're like Fury - but sometimes Fury can beat the Klitschkos'”. Feedback on “'Portlaoise are Klitschko and we're like Fury - but sometimes Fury can beat the Klitschkos'”.